Léandre Pourcelot was born on September 7, 1940, in Orchamps-Vennes, France. He obtained the electrical engineering degree from the Institut National des Sciences Appliquées, Lyon, France, in 1963, and a Ph.D. at Lyon in 1967. He completed medical studies and obtained the Med. D. degree from the faculty of medecine at the University of Tours in 1977, where he also obtained a degree in nuclear medecine in 1980. He is currently a professor, Faculty of Medicine, University Francois, Rabelais, Tours, France, and is Head of the Department of Nuclear Medicine and Ultrasound. He began his professional career in 1963 as a researcher at INSA, Lyon, where he developed the first European ultrasonic Doppler velocimeter. In 1968, he joined the faculty of Medecine in Tours, where he was assistant, associate, then full professor. He also is director of the GIP Ultrasound and INSER-316 research groups. His research activities dealt with ultrasonic instrumentation and clinical applications, and he is principal investigator of several experiments in the field of space physiology. In 1972 he and his research group developed one of the first real-time ultrasound imaging systems based on the electronic scanning of a linear array. Pourcelot was one of the few 'grandfather' pioneers in clinical doppler vascular research. In 1974 he described the "Resistance Index" or the "Pourcelot index" used in the assessment of doppler velocity waveforms (peak systolic velocity minus end diastolic velocity/ peak systolic velocity, reflecting the vascular resistance distal to the point of doppler sampling). In 1977 he described pioneering work on color-coded Doppler images. For the past 40 years he has continously worked at inventing and perfecting doppler devices in Tours, France. He led a team of researchers and clinicians who had devised important and creative experiments in the application of doppler ultrasound in adult vascular diseases as well as in the assessment of fetal conditions, and designed many innovative apparatus for the purpose. They were also responsible for important pioneer work on space physiology and medicine, including the first echograph used on board a space vehicle. Other works included the use of high frequency ultrasound transducers, and techniques in the study of newborn cerebral function, physiology and pathophysiology, and with particular reference to the preterm baby. Pourcelot founded the Société Française pour l'Application des Ultrasons en Médecine et Biologie and is a member of WFUMB and presidents and members of a good number of learned societies. Pourcelot is well known among his colleagues and students and an extraordinarily inspiring teacher, often making learning difficult subjects in physics and physiology very interesting to the new-comer; and an ardent and often brilliant inventor and researcher. In 1995 he was presented the prestigious IEEE Judith A. Resnik Award for his work on ultrasound imaging in the measurement of cardiovascular systems during space flight. In 2003, he was honoured with the Ian Donald Gold Medal for Technical Merit from the International Society of Ultrasound in Obstetrics and Gynaecology (ISUOG). 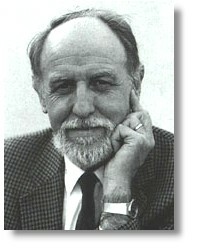 Image of Professor Pourcelot courtesy of the Professional College of Saint-aignan, France.